My family and I recently spent a long weekend in Lincolnshire. You may remember we spent Christmas there last year. We are fond quite of the area and the added bonus of connecting with family. 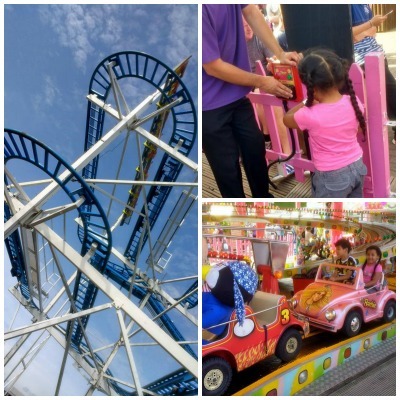 During our recent visit, we spent one a day at Fantasy Island, Skegness. We had never been to that part of Lincolnshire, so we excited to check it out. It was a glorious sunny day when The Tiger Tales visited Fantasy Island, we had an awesome time. Courtesy of Fantasy Island, we had (blue) Discovery wristbands for the day which are priced at £22.00 per person in high season. The wristbands allowed us unlimited access to all rides. Angelo and Valentina are both tall for their ages, so they met the minimum 1.1m height requirement for the wristband. Fantasy Island also has a pay as you go option for rides. Prices ranged from £1.50 for the Carousel (No Height Restriction) a to £4 for G-Force and extreme rides (Minimum Height 1.4m). The wristbands are scan-able at the entry point of each ride which is quite empowering for little patrons; they can do it themselves before boarding their age appropriate ride. Valentina really liked that feature. The most adventurous ride we went on was the Log Flume which was an Adventurer red wristband ride (height restrictions apply) and would have cost £2.50 on pay as you go. Valentina and her dad are the most courageous of us four when it comes to rides but that ride got to her. I think the descent scared her. Both kids loved The Jellikins ride. Honestly, if I could have fit on one of the seats I would have gone too. The Jellikins comprises of Strum, Bouncy, Denny, Pepper & Coral carriages on the Jelly Train that drive little patrons through their Jolly Jelly World. It’s just the right height and speed with bright bold colours that would attract and engage little patrons. Angelo and I went on Mystical Dragon Mountain which took my breath way. We had to climb quite a few stairs to the top, then cross a rope bridge then we boarded a dinghy which made a rapid descent, twisting and turning through a dark tunnel! What a rush! My highlight was the Island Beach. I’m a die-hard island girl. Man, the sun was shining; the sky was blue and reggae playing, palm trees and all. If I wasn’t fully dressed I could’ve easily forgotten that I was still in England. Island Beach has live performances, bespoke deckchair seating, water and sand fun. After the exhilarating rides, we happily settled there for lunch. We bought lunch from The Ranch food kiosk. The food was affordable but it wasn’t as tasty as I had hoped and there wasn’t an option for salad. There wasn’t a live performance during the time we were there but I didn’t miss it. The kids played in the sand. Hubby and I chillaxed in a cabana; listening to the tunes. As you know, hubby is an ole school gamer. He loves arcades! Our final stop was the family entertainment area. We hit the newly refurbished arcade which has mix of the latest video games and traditional games. Although we didn’t try the Ten Pin Bowling, I was impressed by the space and set up. It cost £3.00 per person. ‘Fantasy Island is the first company outside of the US to have Projection Mapping VIP Lane Technology.’ VIP lane cost £6 per lane usually but at the time of our visit were available at £3.00. 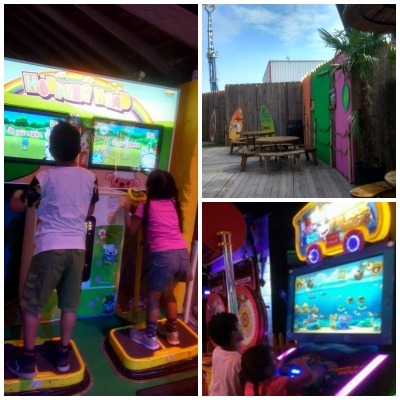 At Fantasy Island there’s fun indoors and out. Guests with disabilities are advised to contact the Guest Services and Sales Manager. If like us you live far from Lincolnshire you may ask ‘why should I travel so far for a theme park?’ Well, Lincolnshire is ideal for a mini break, especially if you fancy outdoor fun. There are caravan parks around Skegness and cottages in Lincoln. 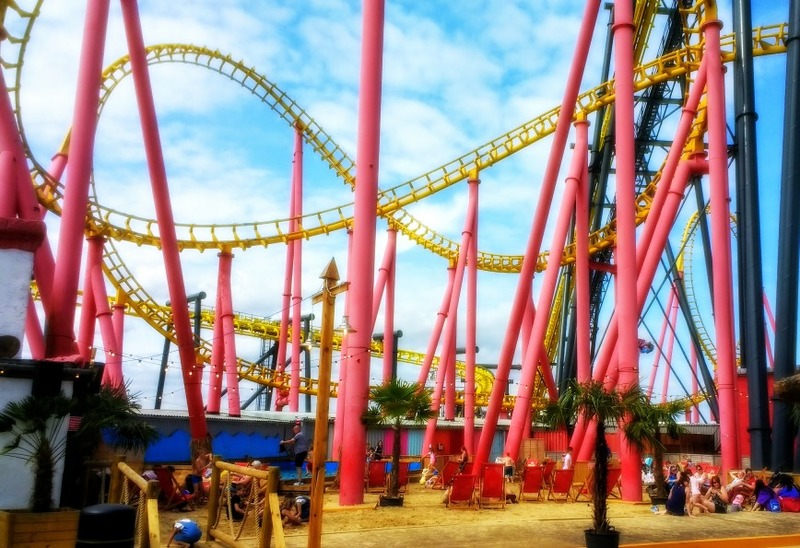 If you are not into extreme rides, you can visit Fantasy Island without going on the rides. The Market Restaurants, Pyramid & Cafes are free entry and the beach is very close by. During the colder months the fun goes on. In October there will be extra Halloween themed attractions such as: Halloween Scare fest, themed fireworks, Halloween Mystical Mountain, Pumpkin carvings from 21st October to 5th November. We were given four ride-all-day Discovery wristbands to visit Fantasy Island for the purpose of this review.